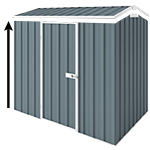 The 3m x 1.5m skillion roof model is popular choice for narrow places. There are amazing possibilities to customise your shed and add a wide range of accessories. You can change the hinged doors to sliding doors, add louvre window, skylight, shelving, tool holders and the list goes on.